luthnuwara Perahera (Pageant) concluded on Sunday (July 28) afternoon. The conclusion of this pageant marked the beginning of the festivities in the hill country. 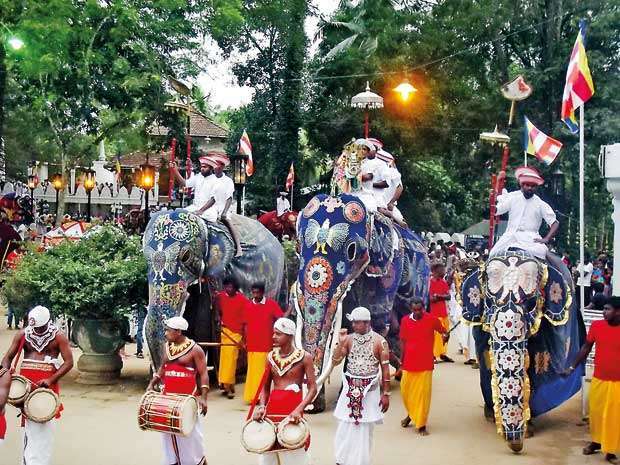 Very few people know that it was from Aluthnuwara that the Kandy Esala Pageant originated. Aluthnuwara has retained its old charm and is surrounded by hills and stretches of paddy lands. One can’t forget the village life here, which is also much talked about. It’s the pageant which gives the place ‘life’ and without it the city would resemble a sleepy town. However, the visits to the Dedimunda Devale continue throughout the year. The only place where there are changes is the area dedicated for God Dedimunda the Devale. He is much worshiped by the folks in the Kandyan hills. They believe that he surveys and rules the area. This ancient pageant has a special significance culturally and socially. The pageant also has a religious significance. It also signifies the interaction that existed between the Kandyan Kingdom and the low country. This interaction is visible even today with the inclusion of Low Country dancers in the Aluthnuwara Pageant. There is no pageant in the Kandyan region without the participation of Low country dancers. Aluthnuwara during the olden days was situated on the cross road that connects with the path to Sri Pada (Adam’s Peak). The initial place which was dedicated to God Upulvan was the place under a huge ‘mara’ tree. This place is right in front of the main building of the Devale. It is from here that King Senarath shifted the statue of the God, ‘Devapathiraja Palikadaha’, and the devale (Shrine) to the Kandy Maha Vishnu Devale. The Devale situated at Aluthnuwara dates back to the period of Parakrama Bahu. But the present building, which houses the Devale, is said to have been built during in the 1700’s by Molligoda Maha Nilame. The Devale is dedicated to God Dedimunda. Many stories are associated with God Dedimunda. One is that God Dedimunda is the son of a Yakshaya (Devil) named Purnaka and queen Erandathi. The other is that a Bandara from the Kandyan Kingdom became a God due to his merits in a past life, but attained the life of a human. The history of Aluthnuwara is not very clear up to date. here is a school of thought that takes us to the origins of Aluthnuwara; a period before Parakarama Bahu. Around 1258, Parakrama Bahu II fell ill (the king developed an unsound mind ) when his Cabinet of Ministers led by Deva Pathiraja sought the help of God Upulvan of Devundera. It is recorded that Pathiraja personally visited Devundara and held a pageant, for seven days to bring blessings on the king, without success. On the seventh night of the pageant Upulvan appeared as a Brahamin. Deva Pathiraja was told that the king’s illness could not be cured and this was attributed to a previous Karma (Sin). Deva Pathiraja indicated that his wish was to build a Devale (Shrine) at Dambadeniya, but following a request made by the Queens, it was build at Aluthnuwara. It was in this fashion that the Devale was built for God Upulvan at Aluthnuwara. In fact the present site, where once God Upulvan was cited, was known as Malwatte. The site was selected by the queen of Parakrama Bahu, Queen Sunethra and the Chief Priest of ‘ the Len Vihare. At present it’s known as Galagama Raja Maha Viharaya. With the setting up of the Devale, the next important task was the installation of an effigy or a figure of God Upulvan. For this purpose a figure of Upulvan was carved out of a ‘Sapu’ tree. The place from where the tree was found is now known as ‘Sapugathkara’. From this shrine a procession comprising elephants and dancers started. There is no indication or evidence of any banners being used during this pageant. Questions are asked whether this is the inaugural pageant of the Central Hills ? There is no indication that a pageant was held in the name of God Natha. 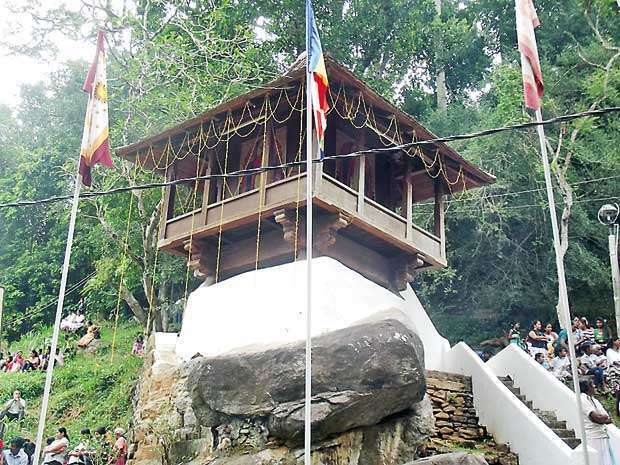 The Natha Devale was the first shrine to be built in the Kandyan Kingdom. 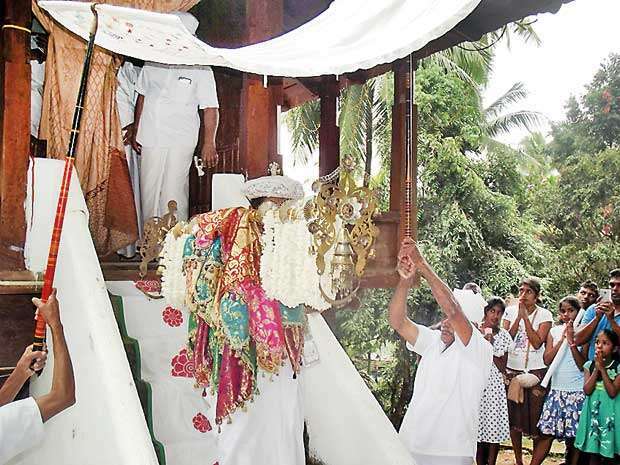 Subsequently there had been pageants for the four shrines in Kandy. However these were organised after Aluthnuwara pageant. The Kandy Esala Perahera received prominence after 1753. This was with the arrival of Ven. Upali Thera from Siam (presently Thailand). He arrived in the island to receive Upasamapada (Higher Ordination). The monk viewing the pageant of the shrine inquired from King Keerthi Sri Rajasinghe whether there was no participation form the Sri Dalada Maligawa (Temple of the tooth) in the Perahera. The King didn’t reply this question, but on the following day added the Sri Dalada Maligawa section of the pageant. Thus a tradition began where the sacred tooth was carried at the pageant. A large number of priests participating in the pageant carried the sacred tooth. At that time there was no Diyawadana Nilame to follow the tusker. With the shifting of the figure of Upulvan to Kandy the shrine went into disuse. At present only the foundation of the shrine remains. It was only a few years ago that a lamp was installed for devotees to light. Presently, Aluthnuwara is the abode of God Dedimunda. This God is regarded as the Prime Minister of Upulvan. On selecting the site close to the old shrine it was found that a huge boulder had arisen. So they tried to blast the boulder, but these efforts had no effect. They then prayed to God Dedimunda to break the rock. God Dedimunda, also known as ‘Sudu Mal’, could command Yakshaya’s (devils). This God then ordered the devils to break the rocks and was accomplished within a night. After the task was accomplished, God Dedimunda drove away the devils. A part of the rock is significant with the ceremony where the ‘Ran Auyadaya ‘ (Golden weapon) is brought out on the final day of the pageant. The building is said to have been constructed by Molligoda Nilame as a offering because his prayers were answered. He prayed that he would not be banished from the Kandyan Kingdom. The Maha Vishnu Devale and the shrine of God Dedimunda. at Aluthnuwara are headed by the Basnayake Nilames of both these Devales. The incumbent Basnayake Nilame is Mahendra Ratwatte. Is it the footprint of God Natha? From Beddegama to Trincomalee: Are we stuck in an artistic groove?